A Review of "Slouching Towards Sirte"
In his new book, Slouching Towards Sirte, which will be released in December, Maximilian Forte challenges many of the prevailing notions, both of the left and right, about Libya and the reasons behind the NATO intervention there which toppled the government of Muammar Gaddafi last year. As Forte explains, NATO’s intervention was many years in the making. NATO, led by the U.S., seized upon the “Arab Spring” and the very real and legitimate protests in Libya to carry through a long-held desire to rid itself of a nationalist government which had aided other struggles for national liberation (such as the struggles of the ANC, the Sandinistas and the PLO). In addition, Libya under Gaddafi was taking an increasingly important leadership role in Africa and was blocking U.S. opportunities for investment and economic opportunities in Libya itself as well as greater penetration into Africa as whole. Of course, the title of the book begs the question of why the town of Sirte is so important to this narrative. As Forte explains, Sirte, in addition to being the hometown of Muammar Gaddafi and the second capital of Libya under his government, has been the gateway of would-be invaders of Africa for centuries. Forte quotes Gaddafi himself on this point who welcomed African leaders to Sirte at the Fifth Ordinary Summit of the African Union in 2005 by describing it as “the frontline city because it confronted the colonial onslaughts and resisted several colonial campaigns aimed at the heart of African since Roman, Byzantine, Turkish and colonial eras, alongside other incursions by the Vandals who were seeking to penetrate deep in to the African campaign . . . Sirte was always the first line of defense against those campaigns.” Forte further relates that Sirte, the city in which the African Union was founded in 1999 largely due to Gaddafi’s own urging, remained a key frontline city – and indeed the envisioned capital for a new United States of Africa — until the time of the NATO invasion. Sirte suffered a catastrophe according to . . . many eyewitness descriptions of endless rows of buildings on fire, corpses of the executed lying on hospital lawns, mass graves, homes looted and burned by insurgents, apartment blocks flattened by NATO bombs. This is what ‘protecting civilians’ actually looks like, and it looks like crimes against humanity. Far from the romantic image of all of Libya having risen up against the ‘evil tyrant,’ this was one side of Libya destroying the other with the aid (to say the least) of foreign forces. And, this is a key point to Forte’s narrative: that while human rights NGOs such as Amnesty International (AI) were quick to call for UN Security Council action to prevent a possible Libyan government slaughter in Benghazi, these same NGOs called for no such action when Sirte was being destroyed block-by-block with the help of the very NATO forces they helped unleash. Far from such calls for affirmative UN action, groups like AI were even muted in their verbal criticisms of this slaughter, downplaying the numbers of the civilian victims in Sirte (and in Libya as a whole) and treating the accounts of human rights violations in Sirte with skepticism. While AI ended up applauding NATO for allegedly making “significant efforts to minimize the risk of causing civilian casualties,” Forte demonstrates that NATO and its rebel allies targeted civilians and civilian infrastructure in Sirte, with the result being many more civilians killed than the mere “scores of [dead] Libyan civilians” which AI attributes to NATO over the course of the entire conflict. Indeed, there is good evidence that there were individual NATO bombing raids – raids entailing the typical U.S. policy of “double tapping” in which an area is bombed once and then again to kill the civilians who come to the scene to retrieve the injured and dead after the first bombing – which killed scores of civilians in Sirte and other locations in one fell swoop. But again, groups such as AI were unmoved. It is this selectivity in treating with real or threatened human rights violations – selectivity based upon who is the aggressor and who is being attacked – which has so undermined the human rights doctrine and the system in which it operates. As Noam Chomsky would say, when the aggressor is a powerful Western entity like NATO, or an ally thereof, its human rights violations do not matter, and its victims are, in fact, “unworthy.” Truly, the civilians of Sirte had the unfortunate fate of being such “unworthy” victims, just as those civilians in Bani Walid who have recently been attacked and laid siege to by the new, pro-Western government in Libya, and just as those civilians now living in Gaza or peasants living in the countryside of Colombia. Showing its hand, the main instigator and leader of the NATO intervention, the U.S., waited no time to move into Libya after the fall of the Gaddafi government to collect its spoils of war. 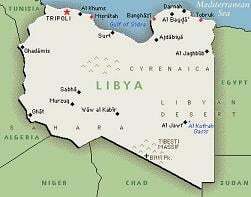 Thus, in September of 2011, even before Gaddafi’s violent murder in October, U.S. Ambassador Gene Cretz “’participated in a State Department conference call with about 150 American companies hoping to do business in Libya.’” As Forte emphasizes in his book which posits that U.S. access to infrastructure investment was an even bigger motive for the intervention than access to oil, the business opportunities discussed in this meeting were indeed infrastructure projects. Forte makes a strong case that the U.S. — despite some warming of relations with Gaddafi before the February, 2011 uprising — had continued to be frustrated with Gaddafi’s blocking of infrastructure projects for such U.S. companies as Bechtel and Caterpillar, instead granting these projects to Russian, Chinese and German concerns. The invasion solved this problem in two big ways. First, of course, the U.S. ensured by its intervention in Libya that a substantial portion of future infrastructure projects would be awarded to U.S. companies. However, the more important, and more diabolical part of the plan, is that the violent intervention itself created the very need for infrastructure projects – what better way to create such a need, after all, then by leveling entire cities to the ground? And, while the U.S. certainly has a great need for infrastructure investment here at home (e.g., to keep cities such as New York from sinking into the sea), such investment has the distinct drawback of having to be paid out of U.S. coffers. In the case of Libya, as was the case of Iraq, the U.S. devastated the country, thereby creating a great demand for infrastructure projects, and then required the country to pay for the projects out of its own oil revenues. “Vulture capitalism” is indeed too kind a term for this type of creative destruction, for vultures feed off carrion that is already dead; in this case, on the other hand, the U.S. creates the carrion for its corporations to feed off of, and at someone else’s expense. Brilliant! Moreover, with Libya’s Pan-Africanist leader Gaddafi out of the way, the U.S. eagle and its newly-formed African Central Command (AFRICOM) swooped in to other parts of Africa to begin further penetration of the continent. Furthermore, ‘barely a month after the fall of Tripoli – and in the same month Gaddafi was murdered (October 2011) – the U.S. announced it was sending troopos to no less than four more African countries: the Central African Republic, Uganda, South Sudan and the Democratic Republic of Congo.’ AFRICOM further announced 14 major joint military exercises planned with African states for 2012, an unprecedented number of such exercises. Much more can be said of this terrible tale of the NATO intervention into Libya and Africa, and I strongly recommend the reader to peruse Slouching Towards Sirte for the awful details. I will simply close this article by saying that, in these times in which we live, it is critical to be wary of any claims by the Western powers, especially the U.S., that they are going to war to protect human rights, for it is almost invariably the case that the war ends up violating more human rights than it protects. Indeed, human rights have sadly become the Trojan Horse the U.S. and its allies NGOs use to justify violent intervention into foreign lands. So, while the Trojan Horse story led to the famous maxim, “Beware of Greeks bearing gifts,” I would counsel the people of the poorer Global South, to “Beware of Westerners bearing human rights.” Certainly, Forte shows why this advice should be heeded.